In Mon language, ကျိုက် | kjite means stupa or Pagoda, and Kyaikhtiyo is the most well-known. Kyaikhtiyo Pagoda, situated at 1,100 meter (3,600 ft) above the sea level, is one of major tourist attractions and a pilgrimage site for Myanmar people. The pagoda is built on a boulder hanging precariously at the edge of the vertical ridge. The mysterious boulder is about 25 feet high and 50 feet in circumference. The base camp 210 kilometer (130 miles) away from Yangon is now accessible by air-conditioned weekend train as an alternative to a five hour drive from Yangon. 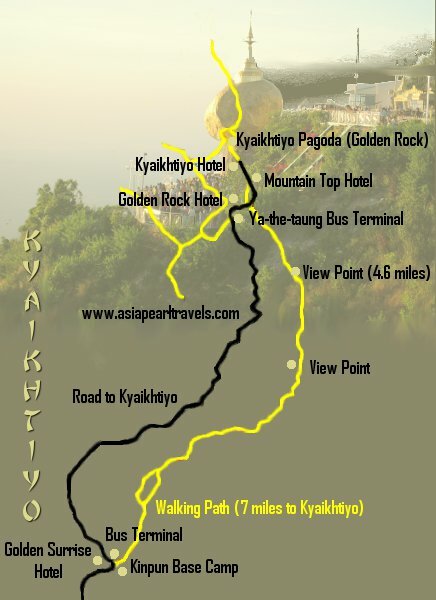 There is a 11 kilometer (6.8 mile) hiking trek from the base camp as well as a paved road to the bus terminal closer to the hotels and the Pagoda at top of the mountain. Vocabulary list continues for single tone word that sound like 'Kite', 'Like', 'Mike'. Those words should be pronounced without closing consonants. So, when the word is romanized as 'like', do not stress on closing 'k' sound. Most of the words in this category are spelled with ိ | lone3-ji3-tin2 on top of the character, followed by ု | ta1-choun3-ngin2 at the bottom, and က် | ka1 thut at the right side. ကိုက် | kite - (1) bite. (2) cut with scissors. (3) ache and pain. (4) suitable. (5) right amount. (6) profitable as in တွက်ခြေကိုက် | twet-chay2 kite. (7) yard = 3 feet. Other usages: (1) ကိုက်လန် | kite lan2 - kai lun (Chinese mustard 芥兰.) ကိုက်လန်ကြော် | kite-lun2 kjau2 - fried kailan. ကျိုက် | kjite - (1) [Mon Language] pagoda. E.g., ကျိုက်ထီးရိုး | kjite hti3 yo3 - Kyaikhtiyo Pagoda. (2) ခါးတောင်းကျိုက် | ga1-doun3 kjite - Burmese male to tuck the Longyi for physical activities by folding the length of the front portion between thighs and tuck in at the back side thus thighs are exposed as if wearing shorts. (3) boiling hot and bubbling up with effervescence as in ကျိုက်ကျိုက်ဆူ | kjite kjite hsu2. ကြိုက် | kjite - (1) like something or someone. (2) happen to be; meet by chance; occur at the same time as in ကြုံကြိုက် | kjone2-kjite. ခိုက် | khite - (1) to cause damage as in ထိခိုက် | hti1-khite. (2) 'while' word to mean during some kind of activity. E.g., သွားခိုက်လာခိုက် | thwa3-khite la2-khite - while going and coming. (3) shivering with cold as in ခိုက်ခိုက်တုန် | khite khite tone2. ခြိုက် | chite - (1) concave. (2) fond of something or someone; to like as in နှစ်ခြိုက် | hnit chite. (3) comfortable and enjoyable (usually sleep, i.e., sleep well) as in နှစ်နှစ်ခြိုက်ခြိုက် | hnit-hnit chite-chite. ဂိုက် | gite - [English] guise. dress up and pretentious as in ဂိုက်ထုတ် | gite htoat. ငိုက် | ngite - head to droop due to drowsiness or sleepiness. စိုက် | site - (1) cultivate crops, vegetable, and trees by sowing seeds, stems, etc. in the soil. Related word: စိုက်ပျိုးရေး | site-pyo3-yay3 - agriculture. (2) sharp object to be penetrated or lodged into something. (3) put an effort as in လုံ့လစိုက် | lone1-la1 site. (4) invest capital, principal amount of money. (5) temporarily loan the money for someone's use. ဆိုက် | hsite - aircraft to land; ship to make port call; vehicle on the road to park. Related word: ဆိုက်ဆိုက်မြိုက်မြိုက် | hsite-hsite myite-myite - reach the destination without any problem; smooth-sailing. Other usage: ဆိုက်ကား | hsite ka3 - [English: side + car] tricycle / trishaw with the capacity to carry two passengers sitting back to back at the side of the pedaler. ဆိုက်ကားဆရာ | hsite ka3 hsa1-ya2 - - trishaw driver. ဆိုဒ် | hsite - corrupted English word 'size' commonly used commercially such as by photo studios. တိုက်စစ် | tite-sit - offensive play in game or to attack in war. တိုက်စစ်မှုး | tite-sit hmu3 - the captain of the soccer team. တိုက်လေယာဉ် | tite lay2-yin2 - fighter plane. တိုက်ရေယာဉ် | tite yay2-yin2 - gunboat. တိုက်သင်္ဘော | tite thin3-bau3 - battleship. (4) rob as in ဓားပြတိုက် | da1-mya1 tite. (5) incite hatred as in ရန်တိုက် | yan2 tite. (6) brush teeth as in သွားတိုက် | thwa3 tite. (7) polish to shine as in ပါလစ်တိုက် | pa2 lit tite. (8) scrub to clean as in အိုးတိုက် | o3 tite. (9) coincide as in တိုက်ဆိုင် | tite hsine2. တိုက်ဖွိုက်ရောဂါ | tite pfwite yau3-ga2 - [English] typhoid. တိုက်ကွမ်ဒို | tite-kwan2-doh2 - [English] Taekwondo. ထိုက် | htite - deserving as in ထိုက်တန် | htite tan2. ဒိုက် | dite - floating rubbish. မဲနှိုက် | meare3 hnite - pick the lucky-draw. ခါးပိုက်နှိုက် | ga1-bite hnite - pickpocket. ၌ | HNITE - [literary] 'at'; location indictator similar to colloquial မှာ | hma2. ပိုက် | pike - (1) hold in the arm close to the body. (2) net as in ပိုက်ကွန် | pike-koon2. (3) [English] pipe as in ရေပိုက် | yay2-pike - water pipe. Other usage: ပိုက်ဆံ | pike-hsun2 - money. ပြိုက် | byite - continuously and profusely. E.g., ချွေးတပြိုက်ပြိုက်ကျ | chway3 da1-byite-byite kja1 - sweat heavily. ဖိုက်တင်ကား | pfite tin2 ka3 - action movie. ဗျူးကောင်းတဲ့ နေရာမှာ ဖိုက်ကြစို့။ | byu3 koun3 deare1 nay2-ya2 hma2 pfite kja1 so1 - Let's fight where the background scenery view is good. ဗိုက် | bite - (1) stomach; belly. E.g., ဗိုက်ဆာတယ်ဗျို့။ | bite hsa2 deare2 byo1 - (stomach + to be hungry + ending word + proclamation) = I am so hungry. Related word: ဗိုက်နာ | bite na2 - stomach-ache. (2) pregnant as in ဗိုက်ကြီး | bite kji3. (3) beer-belly as in ဗိုက်ရွှဲ | bite shweare3. ဗျိုက် | byite - wet land with grassy vegetation and shrubs as in ဗျိုက်တော | byite tau3. မိုက် | mite - (1) dark in the night as in မှောင်မိုက် | hmoun2 mite. (2) stupid and foolish as in မိုက်မဲ | mite meare3. (3) rude as in မိုက်ရိုင်း | mite yine3. (4) [slang] equivalent to American slang "cool". E.g., မိုက်တယ်ကွ။ | mite deare2 kwa1 - impressive! (5) [English] microphone. မြှိုက် | hmyite - (1) become scorched or singed due to intense heat or dry condtitions. (2) cheat; deceive. ရိုက် | yite - (1) hit; strike; administer corporal punishment such as caning. (2) take picture, video, movie as in ဓာတ်ပုံရိုက် | dut-pone2 yite - take photograph. (3) play golf, tennis, badminton, table-tennis etc. that involves hitting the ball or shuttle with the club, racket, paddle, or bet. ဂေါက်သီး ရိုက် | gout-thi3 yite - play golf. (4) play cards as in ဖဲ ရိုက် | pfeare3-yite. ရှိုက် | shite - (1) sob as in ငိုရှိုက် | ngo2 shite. (2) breath in as in ရှူရှိုက် | shu2 shite. Related word: အရှိုက်ထိ | a-shite hti1 - receive a physical blow or get hit in the vulnerable spot. လိုက်ကာ | lite ka2 - drapes; moveable screen. လိုက်ချီး | lite chi3 - lichee. လိုက်ပွဲ | lite pweare3 - extra dish for second helping. လှိုက် | hlite - (1) have an unsettling feeling sometimes accompanied by excitement or fear as in လှိုက်ဖို | hlite pfo2. (2) whole-heartedly as in လှိုက်လှိုက်လှဲလှဲ | hlite-hlite hleare3-hleare3 or လှိုက်လှဲစွာ | hlite-hleare3 swa2. ဝိုက် | wite - (1) action that does not follow a straight path but curved such as throwing a curved ball in baseball or kicking a freekick in soccer by some professionals. (2) speak indirectly and tactfully as in သွယ်ဝိုက် | thweare2-wite. ဝှိုက် | white as in စနိုးဝှိုက် | sa1-no3 white - [English] Snow White. သိုက် | thite - (1) group; bunch. (2) nest as in အသိုက် | a-thite. (3) celebration or festival that is well-attended and alive with a teeming crowd as in သိုက်မြိုက်စည်ကား | thite-myite si2-ga3. (4) mineral deposit as in သတ္တုသိုက် | thut-tu1 thite. (5) hunt or dig for hidden treasure as in သိုက်တူး | thite tu3. ဟိုက် | hite - (1) a shirt or dress that shows the cleavage as in ရင်ဟိုက် အင်္ကျီ | yin2-hite ain3-ji2. (2) exclamation equivalent to "Gosh!" or "Oh, my God!" Other Usage: ဟိုက်ဒရိုဂျင် | hite-da1-ro2-jin2 - [English] Hydrogen. အိုက်စကရင် | ike-sa1-ka1-rin2 - [English] ice-cream. အိုက်တင် | ike-tin2 - [English] acting. E.g., အိုက်တင်မခံနေနဲ့။ | ike-tin2 ma1-khan2 nay2 neare1 - Don't be so modest. That phrase is used to tell someone that if he really wants something, stop pretending like he does not. Other Usage: အိုက်စလန် | ike sa1 lunn - Iceland.